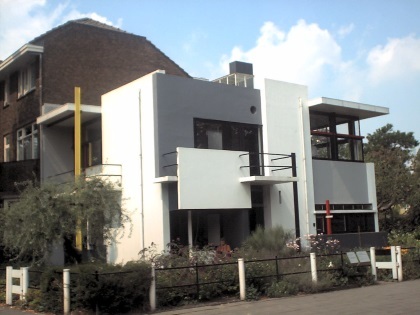 The Rietveld Schröderhuis (Rietveld Schröder House) was constructed in 1924-1925 by the famous artist Gerrit Rietveld. It was his first attempt at designing a complete house. He got the assignment from a Mrs. Schróder, who was very impressed by his ideas. Together they developed this unique house. To comply with building regulations they restrained themselves at the ground floor. This has a fairly normal layout, with a hall, a kitchen and a living room. Mrs. Schróder and her 3 kids didn't live there though, they preferred the space upstairs. That's the place where one large room can be divided into 4 little rooms and a hallway, by just moving around some wooden and cork screens on rails. 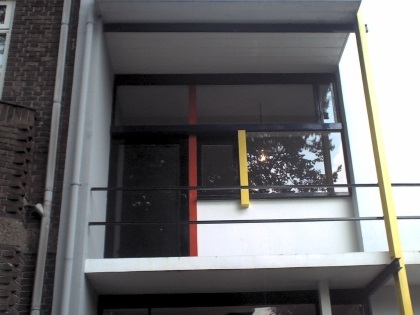 The house was built according to the architectural principles of the "Stijl"-movement: only the typical colours red, blue and yellow are used, in combination with the non-colours white, grey and black. The furniture inside was also made by Rietveld, in the same style and colours. Mrs. Schröder lived in this house until she died in the 1980s. Nowadays it is open to the public and you can visit it on a guided tour. 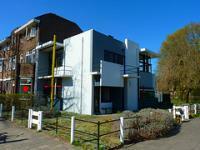 Most remarkable aspect is that when Rietveld built this house, it was situated on the outskirts of the city of Utrecht. Only one year later a four lane motorway was developed next to it, ruining both the sight and the quietness. Rietveld and mrs. Schróder must have been devastated by this. I took the tour with my mother, and we both thought it was very worthwhile. There are so many little ingenious aspects about the house that it's amazing. And to think that it was built in 1924, what a revolution it must have been at the time. I'm glad the Rietveld Schröder House is a World Heritage Site because not only is it an impressive piece of architecture, it also introduced me to the wonderful city of Utrecht. It is unfortunate photography is not allowed inside the Rietveld Schröder House, because the exterior does not do justice to the interior's inventive use of space. Downstairs the house is divided into rather traditional rooms, such as a kitchen and a studio. Upstairs, however, is an open floor plan which can be cleverly subdivided into rooms by movable panels. Gerrit Rietveld employed De Stijl principles when creating the architecture and furniture of the house, which give the house a clean, functional style. The Centraal Museum has an exhibit on Rietveld's furniture designs, and I'm glad I had seen the exhibit prior to visiting the house in order to further appreciate his work. There is much to recommend in Utrecht beyond the Rietveld Schröder House and the Centraal Museum -- I highly enjoyed the Dom Tower (which has incredible views), the medieval center of the city with its walls and churches, and the scenic Oudegracht, a canal in the heart of the city, when I visited two years ago. Logistics: Although you can rent a bike or take a bus to get to the Rietveld Schröder House, I highly enjoyed the walk from the Centraal Museum, where the tour tickets are sold. I visited the Rietveld house in July 2015. It's really interesting with the rest of the houses there to see the contrast. Thinking away the highway as it was built before that was there. How the upper floor is changed into the seperate rooms is just amazing. I like also the prime colors everywhere and the links and that everything is together. I would like to have a house like this now, but a bit bigger probably and modernized (more automatic). on the link below my photos. Did a few inside to, which was actually not allowed. Having read the reviews on this site I decided to visit the WHS without doing any research. The exterior was quite 'normal' although that should have already been a good enough indicator of what to expect inside! What looked 'normal' now was actually built in the 1920s! I had made a reservation online and I collected my ticket from the central museum. They give you an audio guide and shoe cover-ups to wear over your shoes inside the house. The interior of this house is nothing short of a genius' creation. The entrance fee is quite expensive (14.50e!) and you cannot take photos inside but I found the visit to be truly worth it. I'm no architecture geek but I was utterly amazed by the interior of the Schroder House. This is surely my favourite WHS in the Netherlands! I visited the Rietveldt-Schroder house on a cold windy morning a year ago by taking a #4 bus from Utrect Central station to Hoogstraat and walking down Prins Hendriklaan. I bought a ticket (8 euros, 6 for over 65s) at the visitor centre around the corner from the house and took a tour of the house using a recorded commentary in English. I really enjoyed visiting this site; it was my favourite World heritage site in the Netherlands. Twentieth century/ Modern architecture has turned into something of a special area of interest for me and as such this house really impressed me. One of the first things that strikes you about the house is how small it actually is, and also how radically different it is from the other houses on the road. In fact I would suggest that this is one of/ if not the smallest world heritage site, defiantly the smallest I have visited. 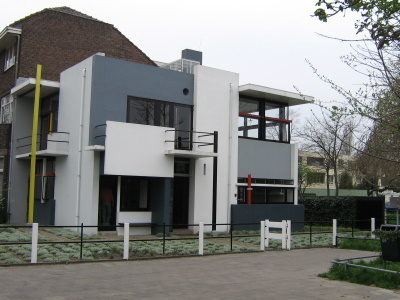 I did a little bit of background reading before my visit to get some insight into the De Stijl movement, which produced the exceptionally clear but somewhat Utopian principles from which this house developed. Rietveld was a carpenter by trade and is famous for the stools he created; especially the Red and Blue Stool, there are many criticisms’s of these though as being more sculptures than practical objects. They are seen as Utopian as the straights lines and angels are not designed for a human body, but for an ideal of what the body should be. I was expecting the house to be very similar; however the very close collaboration between the architect and client has led to this being a hugely practical house. The huge amount of ingenious small details and contraptions are the result of Rietveld’s background as a carpenter making everyday items and the need to make the house a practical machine for living in, not just a sculptural space. I have visited a quite a few architecturally ‘important’ houses built in the last 150 years and it was nice to have points of comparison. The houses designed by Horta in Brussels were built only 20 years before in a similar area of Europe and yet they could not be more different, the horrors of the First World War had brought an end to the ornate decoration of Art Nouveau and De Stijl led the way in rejecting ornament using only primary colours. 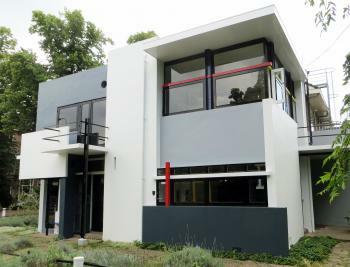 De Stijl was a fore runner to the Bauhaus and when comparing the Tugendhat Villa (Mies van der Rohe) the finishing in Rietveld’s house is not as clinical and developed, however the practical nature of the house is much greater than it is in Mies’ masterwork. The house is on the outskirts of Utrecht, which is actually a very charming city and well worth a visit. There are great rail links to most places in the Netherlands, 35 mins to Amsterdam, and a bus that runs to Kinderdijk 30 minutes past the hour from the station. To view inside the house you have to go to the Centraal Museum, (you will NOT be able to get inside if you go straight to the house itself). The entrance fee is very high €16, it does however give pay for an excellent guided tour of the house, entrance to another Rietveld designed apartment, return travel from the museum to the house, entrance to the Centraal museum, and a cup of tea/coffee at the museum. Despite the high entrance fee we really enjoyed this site and even if you are not a big devote of Modernist architecture it is worth the time to see inside, the huge amount of ingenious small details are enough to keep most people entertained. It is a really important monument to an influential movement in Modernist thought. A few years ago I visited the Rietveld Schroderhuis, and even though it's quite expensive to visit, I am glad I did it. At the tour they gave (you are not allowed to wander around by yourself) they told us a lot of info and it turned out the house had a lot of nifty things that you probably wouldn't have noticed yourself. When you visit the house, make sure you also visit the Centraal Museum (not too far away from the house, make sure you buy a combination ticket; it'll safe you money) where they also have a lot of furniture from Rietveld on display. Modern architecture is not really my cup of tea, but a trip to Amsterdam in winter doesn´t leave you many options for nearby WH sites, and since Utrecht is just about 30 minutes by train, I thought I´d give it a try, and it was actually quite nice. Utrecht is a pleasant and historically important city with a big cathedral and a belfry, and the well-organized, but rather expensive tour from the Central Museum doesn´t require much organizing. I guess I wouldn´t have found this out-of-the-way building on my own, anyway. The architecture has been described in great detail here, so everybody will know by now that this house is incredibly small (yes, I can´t imagine that there would be a smaller WH site, either), but very well planned and constructed, with lots of small details you couldn´t notice yourself. So it was a nice outing on an untypically pleasant winter day, and since it was my personal 100th WH site, there was nothing I could complain about. I like the efficiency of space in the house and impressed by the detail touch of the designer inside the house that showed how smart and thoughtful he was. 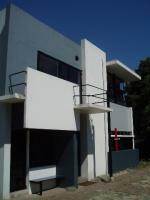 The house is very contrast with other houses in the area, which makes it very unique. Unfortunately the highway ruined the initial beautiful view and landscape surroundings. 187 Community Members have visited.